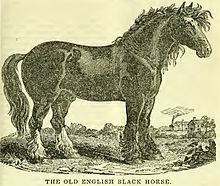 Old English Black, or Old Kladruby, are an extinct horses developed in Britain. During the Norman Conquest of 1066, the brittish took some of the Great Horses from the mainland Europe across the English Channel and crossbred them with native mares. Eventually, a distinct breed developed that was known as the Old English Black Horse. Despite the name, they were not a color breed. For a long period of time, bays and browns were more common in this breed than blacks, but, there were also roans, grays, and chestnuts among them. The color markings on the old English black horse were similar to Clydesdale horses, with the desired pattern being four white stockings and a well-defined bald face. Large Dutch horses (possibly of Brabant and Friesian descent) were imported to England by William III when he discovered that the cart horses of his era were not strong enough for the task of draining the Lincolnshire Fens, these horses became known as Lincolnshire Blacks. Eventually, Old English Black Horses became extinct as a distinct breed when their bloodlines merged into other breeds. The Old English Black Horse heavily influenced the bloodlines of the Clydesdale and Shire, and these breeds today have many features inherited from their ancestors.